This is where zoning designations for parcels within the City can be obtained for locations with addresses assigned by the City. Step 1 : Find and select the street name from the list below. 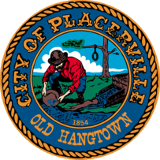 Note: There are many vacant un-improved parcels within Placerville that may not have an assigned address. For parcels such as these and for other questions regarding zoning, you may call the 24-Hour Zoning Request Message Line at (530) 642-5595 . Please leave your contact information, as well as the identifying Assessor Parcel Number or numbers for staff to research prior to returning your call.